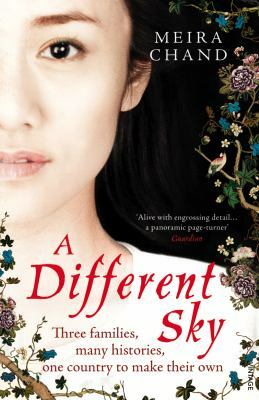 I just finished reading A Different Sky by Meira Chand; one of the best historical novels I’ve read in quite a while. I picked it up because of several excellent reviews and was absorbed immediately by the setting and the characters. It also helps that it’s set in Singapore, a place I visited 12 years ago, but I am drawn in general to historical novels set in Asia. Chand’s story starts in 1926, when 6 people riding on a bus witness a demonstraton by a group of communists in which a British official is wounded. That incident is a harbinger of things to come, and for those people on the bus, their lives are never the same, indeed, from that point they are hurtling toward catastrophic changes and unimaginable terrors. We follow these families’ interwoven stories from 1926 to 1956, sharing the changes those years brought in their lives and in the political realm. In 1926, Singapore was a British colony, part of Malaya. Its polyglot population of Chinese, Eurasians, and Indians, with their various loyalties, traditions, and expectations, makes it a rich source for a good storyteller like Chand. Her particular gift, in A Different Sky, is to create characters that live and breathe and that we care about. They all go through searing experiences, losing much of what they value; Chand keeps us at their side with her astute descriptions of their psychological states. What I also loved about the book was that Chand loves her characters–all of them–even the ones who don’t behave so well. There’s lots of history in A Different Sky, all of it based on historical records and none of it dry. The brutal Japanese invasion and occupation of Singapore in World War II is central to the story along with the post-War agitation for independence. There are some historical characters, like Lee Kwan Yew, who came to play such a pivotal role in Singapore’s history for so many years. I’ve always admired writers who can take the historical record and give it life; that’s Chand’s gift in A Different Sky.